Hello Carpets is proud to provide carpet cleaning Beaverton, Oregon residents trust. We provide professional carpet cleaning services to both residents and businesses in the community. Hello Carpets is a local, family-run company that cares deeply for the Beaverton community and the health of its homes and residents which is why we are so proud to provide cleaning services free of toxins and harsh chemicals. You can book an appointment online in 60 seconds or less using the button below or call us today (503) 765-6264. Too many homeowners do not feel the need for professional carpet cleaning and disregard caring for their floor. Often, a homeowner will delay hiring a steam cleaner in Beaverton because their carpet doesn’t “look dirty”. Unfortunately, the surface of carpet only tells half of the story. Underneath the surface of carpet are pounds of dirt, bacteria and toxins invisible to the human eye. Studies estimate that there is one pound of soil or dirt in every square foot of carpet. This means that even if your carpet doesn’t look dirty, if it has been more than 6-12 months since you last hired a carpet cleaning company, it is. The deep dirt does the most damage. Soil beneath the surface of the carpet wears down the fibers and causes discoloration and flattens the fibers too. This dirt can also reduce the performance and resiliency of the carpet pad which will lead to deterioration of the carpet too. For healthy carpeting in your home or business, manufacturers – including Shaw Industries – recommend to schedule steam cleaning every 6-12 months to remove the deep dirt beneath the surface. This is something that vacuuming alone cannot do. Routine vacuuming helps prevent a percentage of dirt from permeating the surface of the carpet but it cannot remove soils below the surface or in the pad. That’s where Hello Carpets comes in! Hello Carpets will arrive at your home or business and provide an on-site consultation in order to explain our process and answer any questions you might have concerning the equipment and solutions we use for our steam cleaning techniques. Then the cleaning begins. We use industrial, heated extraction equipment that is state-of-the-art and designed to safely and successfully remove bacteria and unwanted soils deep in carpet. Hello Carpets utilizes a truck-mounted system for even more power. The equipment provides powerful suction and is able to create 230 degrees of heat for sanitizing carpet and extracting dirt. During the process, we use a neutralizing solution for fluffier, softer carpet that is free of harsh chemicals as well as a rotary jet system able to restore the resiliency of the carpet. After the cleaning is complete, there is minimal drying necessary and no soap or unwanted residue left behind in the carpet. All that’s left is healthy, clean and beautiful carpet for you to enjoy! We have “Carpets” in our name but our cleaning services don’t stop with floors. Hello Carpets deep cleans upholstery too to restore the color and comfort of the furniture in your home or even your car interior. Why do you need professional upholstery cleaning? 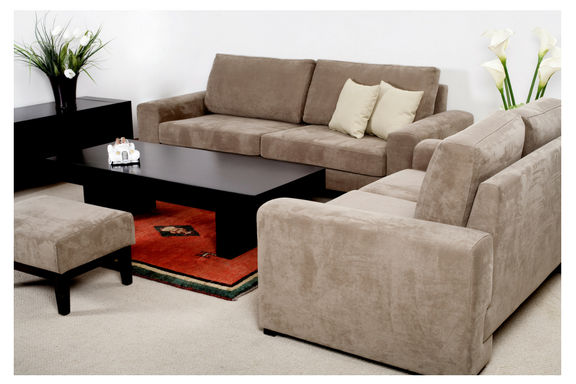 Your furniture endures a serious amount of wear and tear day after day. This is especially true if you live with children or animals. Toddlers and even teenagers can do a number on upholstery and so can your pet! In no more than a year’s time, upholstery will start to wear down, fade and collect dust and dirt beneath the fabrics on the surface. Similar to carpet, embedded dirt will damage your furniture if it isn’t removed before too long. Don’t let that happen. Call (503) 765-6264 for Hello Carpets in Beaverton, OR. Our friendly technician will arrive at your home and evaluate and inspect your furniture to determine the materials and the best method for successfully cleaning the upholstery. The technician will consider color fastness as well as dimensional stability in determining the best course of action. Each type of fabric is unique and it requires an expert eye to ensure the proper solutions and methods are used for cleaning. Then Hello Carpets vacuums the cushions, arms, sides, headrest and back of the furniture to remove dirt, dust, debris and crumbs on the surface before we spray our specialty cleaners on the upholstery. The cleanser helps loosen the deeper dirt and soils before we turn on our hot water vacuum for deeply rinsing and extracting the dirt. For hard-to-remove stains and spots on the furniture, we go one step further and use a horse-hair brush and before we’re done, we clean your decorative pillows too! Then, before you know it, your furniture will be dry and have that “like-new” look you can only get from an upholstery cleaning appointment from Hello Carpets. Did you know your area rugs need deep cleaning too? They do and Hello Carpets can do it for you! 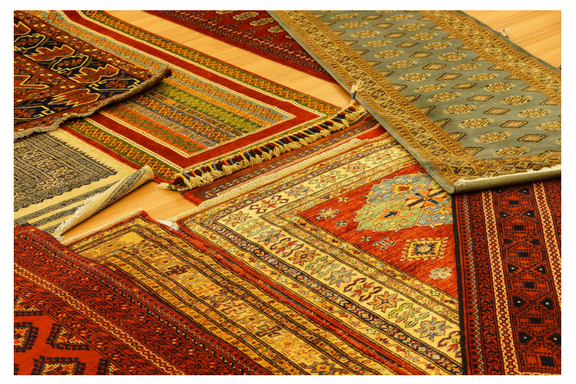 Your rugs are in some of the highest traffic areas in your home. Homeowners place rugs in hallways, doorways and in front of the kitchen sink. Over time, this much foot traffic will lead to colors fading and materials deteriorating unless the rugs receive the proper care. Hello Carpets comes to your home and loads up our van with your area rugs for delivery to our very own cleaning facility. Once there, our rug cleaning experts inspect your rugs to determine the materials, extent of damage, fibers and dyes before the cleaning process begins. We won’t start our area rug cleaning service before we provide an exact quote for the cost of the service. If you’re happy with the quote, the process begins. First, we perform dust removal using specialized equipment able to extract sediments and embedded particles a vacuum cleaner or DIY methods cannot. Then we wash your rugs. The exact process for washing depends on the soiling and stains identified during the inspection as well as the construction of your rugs or if pet odors and urine are present. We then transfer your area rugs to our drying racks. We keep the drying racks in a controlled environment where we monitor the humidity and temperature levels to ensure rugs dry at the ideal rate. The next step is to card the rugs. You might not be familiar with the carding process. This is where we will smooth and soften the surface of the rug and remove unwanted impurities and shortened fibers. The end effect is clean and aligned fibers that form a continuous, untwisted string we call a “sliver”. Once carding is complete, we perform a post-cleaning inspection to ensure the results of the service are as expected and then we return your rugs to you!